Michael J. (Mick) Prodger was born in North Wales and grew up in Sussex, England, where he developed a keen interest in the rich history of his surroundings, especially World War Two. After completing Art College he worked as a graphic designer and syndicated cartoonist before moving to the USA where he co-founded a successful advertising company. Well-known for the scholarly approach and research in his writing, his acclaimed reference books on vintage military aviation equipment are considered definitive works. “When I first met Vito Cellini, in May 2015, I had little idea of the adventure we were about to embark upon together. It has been a journey through time and distance, traversing almost a century of cultural and political change throughout the world. Our travels took us across Italy and the Adriatic sea into what is now Croatia, as we retraced his childhood and World War Two experiences with the Italian Army, the Yugoslavian Partisans, and eventually as an agent with the Allied intelligence services before returning to America after the war. 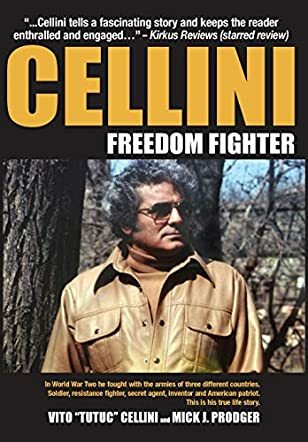 Cellini - Freedom Fighter: This Is His True Life Story by Mick J Prodger is a non-fiction biography on the life of Vito Cellini. Mick explains in the Foreword that anyone with a knowledge of firearms will immediately recognize Vito’s name for his inventions and patents, etc. But the book is about Vito’s entire life and Mick takes us all the way from the beginning of his Italian roots, his childhood in New York and Italy, his enlistment in the armed forces during World War II, his involvement and experience with Yugoslavian Partisans, his switch to working as an agent for the Allied Forces, the return to America, his dealings with private organizations, the government, and the underworld regarding his expertise in weaponry and tactical warfare, his relationships and marriage to the only woman who mattered to him, his wife Franci, and more. There are also several photographs and memorabilia scattered throughout the book that complement the writing. Although Cellini - Freedom Fighter is a biography, the fact that it is written in close collaboration with Vito and his family almost makes it feel like a memoir or autobiography. The book is written in a fairly sequential manner and tells of Vito’s adventurous life journey from his childhood all the way up to his present age. I appreciated that he was clearly a one-woman man and found this fact refreshing, especially from someone of that era and that particular cultural background. Vito comes across as a very sensible, decent, and intelligent man and his agnostic perspective in particular, coming from someone who knows the battlefield, is grounded and feels real. Mick J Prodger has managed to capture the essence of Vito’s personality, which makes this a very interesting read.